Post 4 of a series – you can read my other US posts here and ‘Like’ the blog on Facebook here. 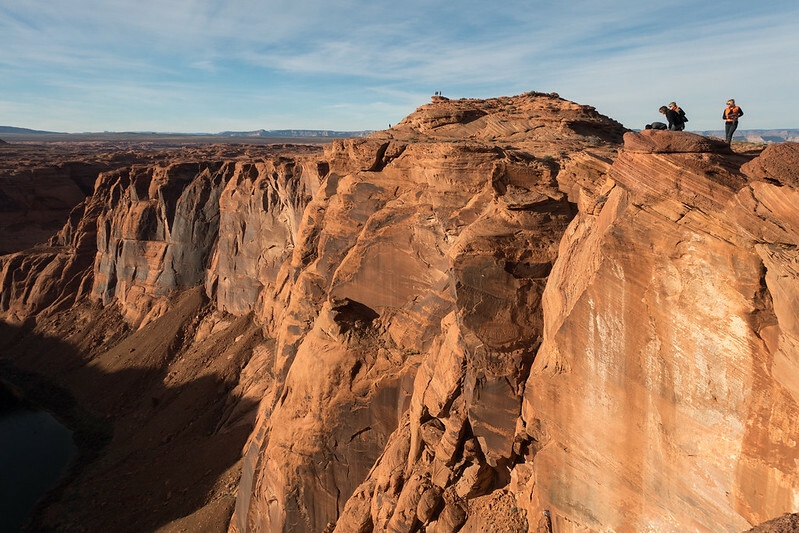 In one spectacular three-hour drive we travelled from America’s best-known landscape, to possibly its most underrated. 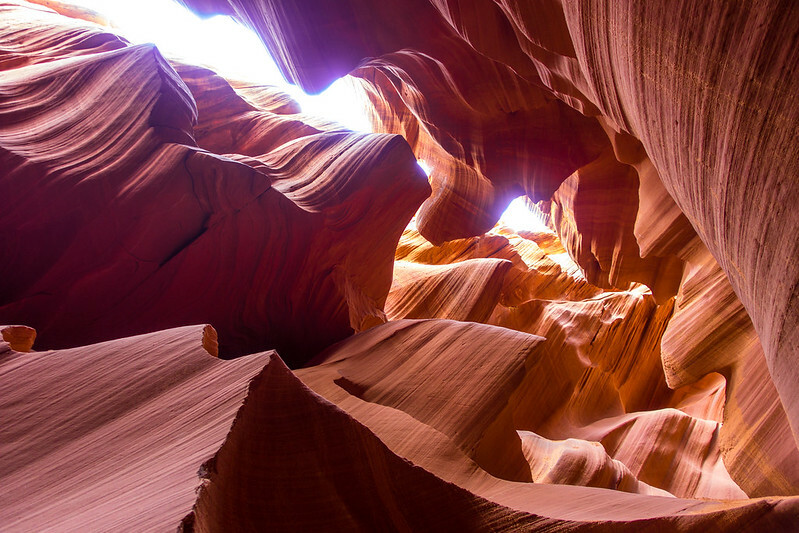 Page was the only stop on our road trip that wasn’t a National Park, but it could have been. 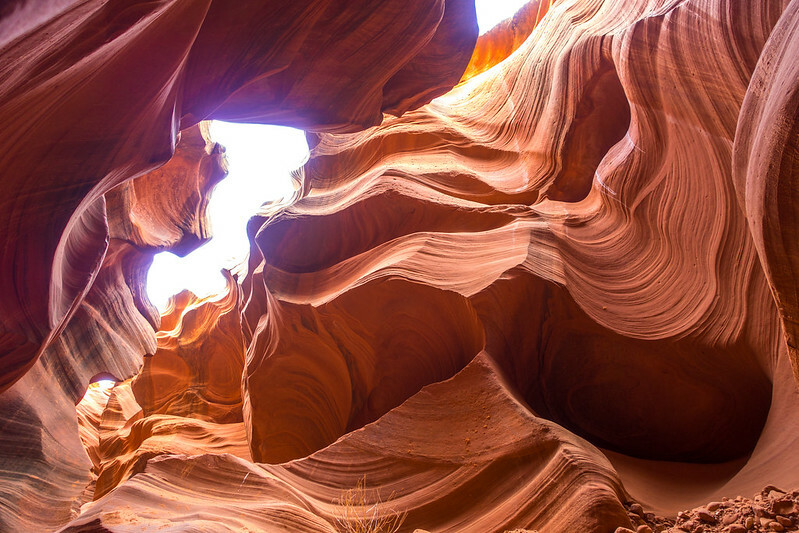 The landscapes and landforms we saw here – from the narrow folds of Antelope Canyon to the wide arc of Horseshoe Bend – were among the most amazing of our trip. Driving away from the Grand Canyon, we were surprised to realise that the scenery only got better as we drew further away. Strange and wonderful mountains of yellow-orange rock tufted with bleached grass undulated outward on either side. Colours graduated from green to ombre. The road ahead appeared striped with shimmering puddles that disappeared as we approached. 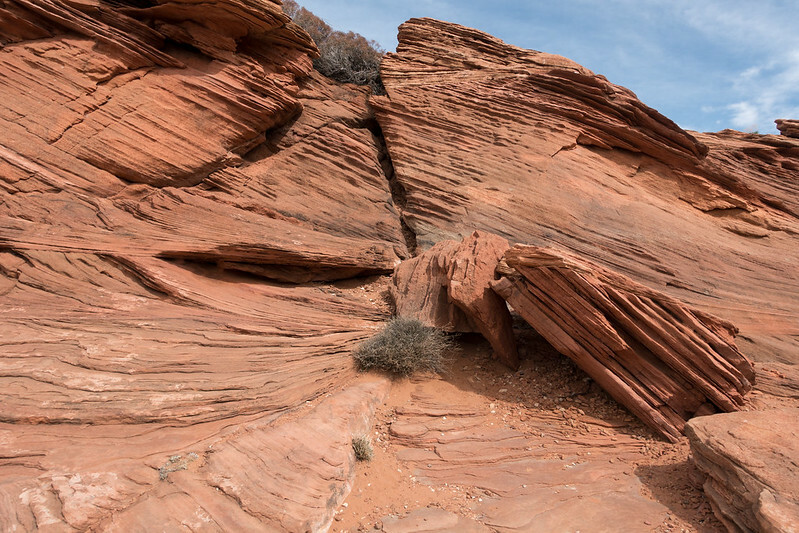 Further along, jagged red cliffs began to rise up from the dusty earth. 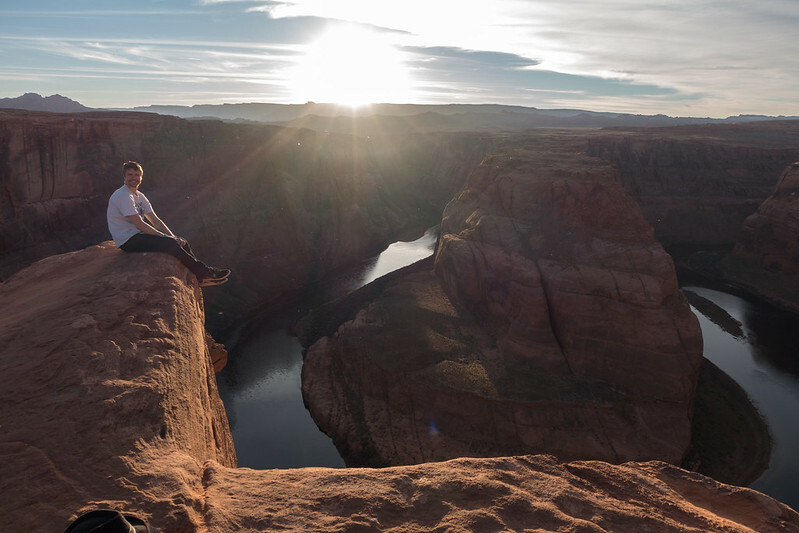 We reached Page in plenty of time, so after checking into the Best Western Plus (a pleasant but fairly nondescript hotel) we decided to visit Horseshoe Bend. We found it easily, by following the map printed on a single-sheet tourist newspaper we picked up in the hotel lobby. Joining many other cars in the dusty car park, we followed the stream of people up the large sandy hill in front of us. At the top there was about half a mile more of sand dunes to navigate until we finally emerged at the large plateau overlooking one of the world’s most photographed river bends. I’d seen it so many times before that peering over the edge and seeing it for myself felt like meeting a beautiful celebrity. 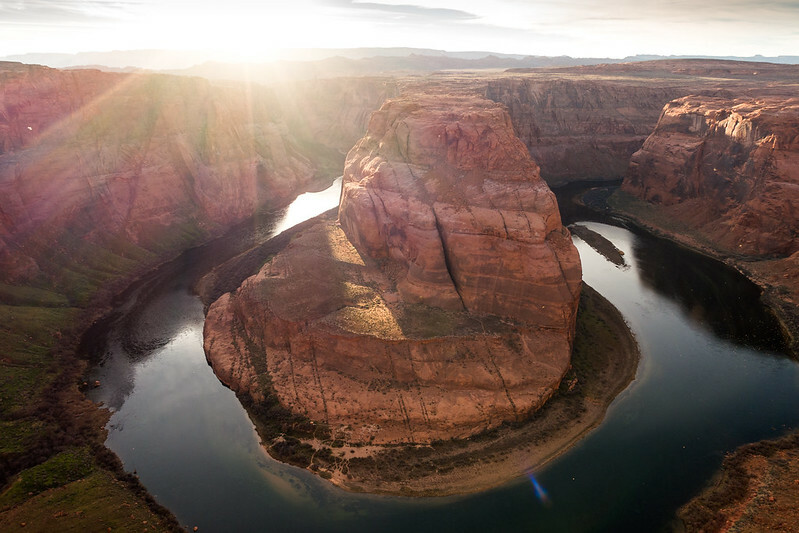 Horseshoe Bend was a wonderful sight to behold, made all the more dramatic by its unexpected colours: Colorado River was a loop of smooth blue ribbon, edged by green ruffles and encased within rough walls of firey sandstone. Realising that sunset was close, we found a scenic pinnacle from which the whole bend was visible and settled down for the show. 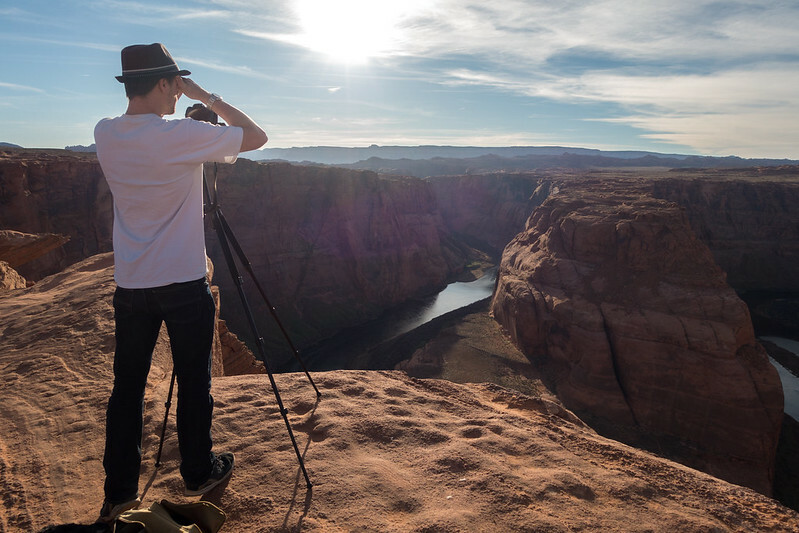 This is essential if you want a good spot, as you have a lot of competition among the professional photographers, life-risking selfie-takers, whining children and buzzing drones. The bright setting sun directly ahead made photographing the scene difficult but, like at the Grand Canyon, the best view was watching the river and rocks change colour as the light dimmed. When dusk fell we returned to the car and went to find dinner. 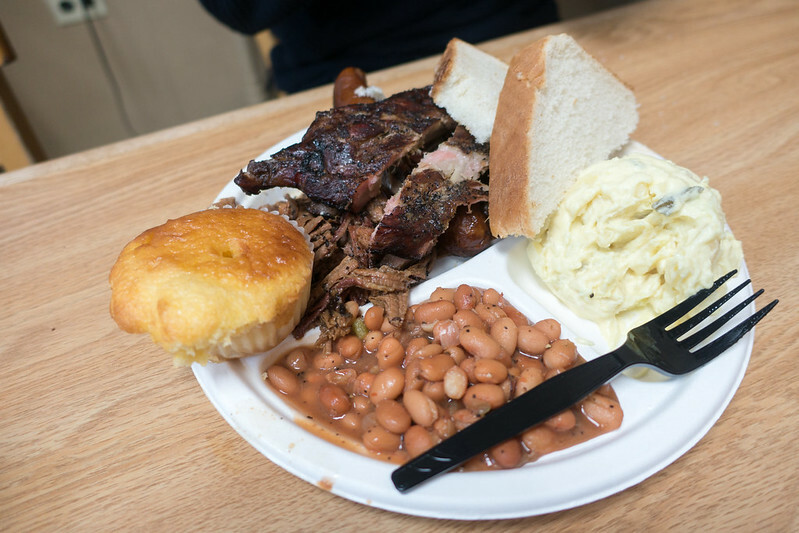 Big John’s Texas BBQ, with a large smoker sat outside, immediately grabbed our attention. 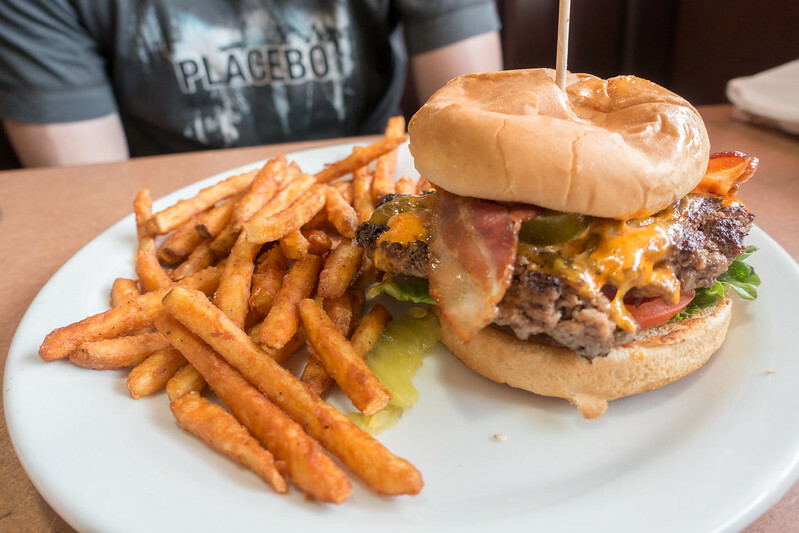 Inside, it was the definition of casual dining – the simple, scruffy restaurant was little more than a takeaway with tables for those eating in. The food was served in polystyrene boxes and the drinks in tall disposable cups. The homemade ‘iced tea’, I found to my distaste, was simply cold tea! But what this place lacked in style, it made up for in substance; or more specifically, its meat. 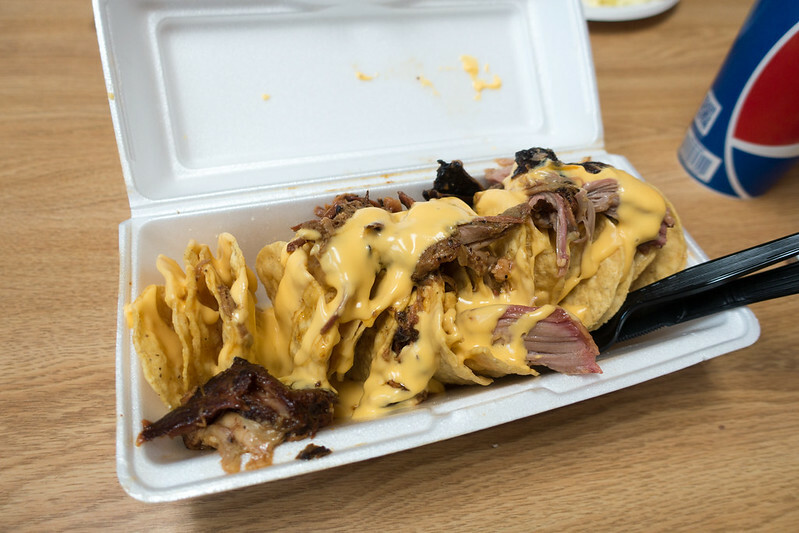 I ordered the nachos with cheese sauce and pulled pork, while Steve went for the sampler plate of smoked beef ribs, beef brisket, hot link sausage, pulled pork, cowboy beans and creamy potato salad. The slow-smoked meat within these selections was the tastiest, most meltingly succulent we’d ever tasted. The juicy deep-pink chunks of pulled pork were unrecognisable from the dry shreds too often defined as such, while the smoked beef ribs tasted of bonfire (in the best way possible). We desperately wished we could bring Big John and his smoker back home with us. 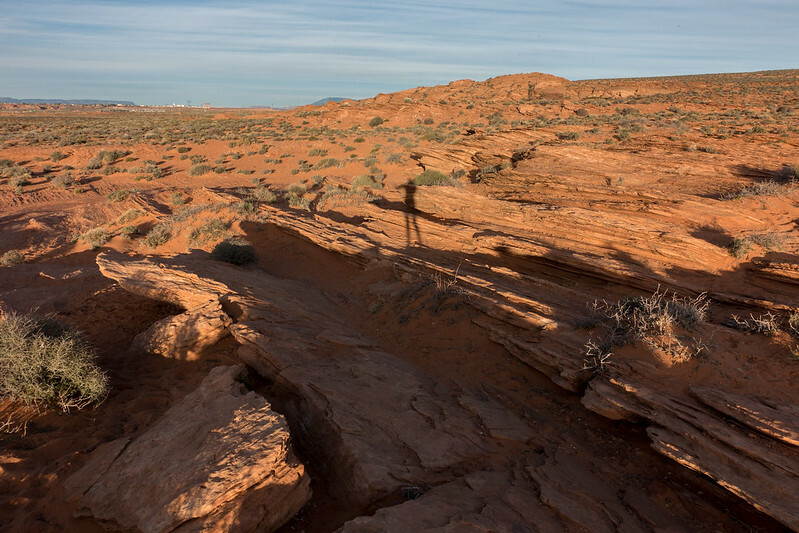 The following morning, we enjoyed a big breakfast buffet at our hotel before driving out to Lower Antelope Canyon. 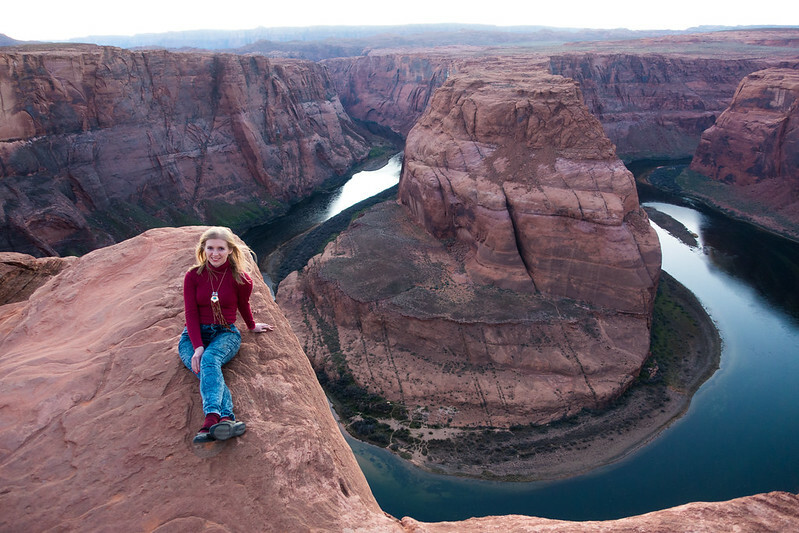 Unfortunately, this was not as easy to find as Horseshoe Bend. We missed the turn-off by several miles and only managed to find it after a radio advertisement for Dixie Ellis’ Lower Antelope Canyon Tours came on and provided instructions on how to find it! (You need to look for the power plant, then take the road to the left towards Antelope Point / The Marina). 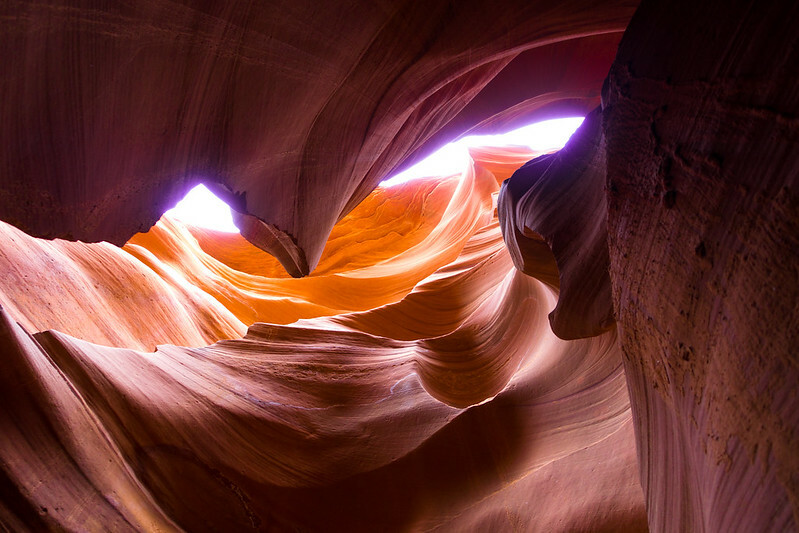 Dixie Ellis is one of two companies offering tours of Lower Antelope Canyon, which is the only way to see it (you’re not allowed to go there without a guide). 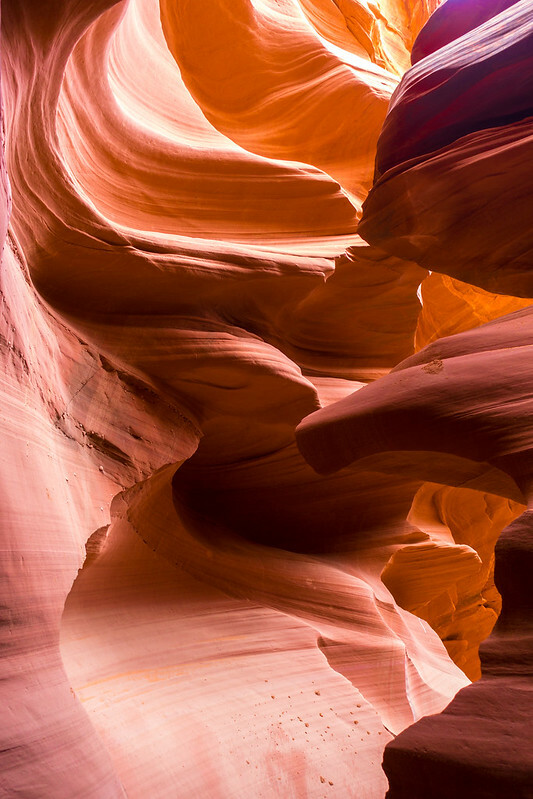 There are more options available for visiting Upper Antelope Canyon – the more popular and accessible of the two – but we chose the Lower instead for precisely those reasons. 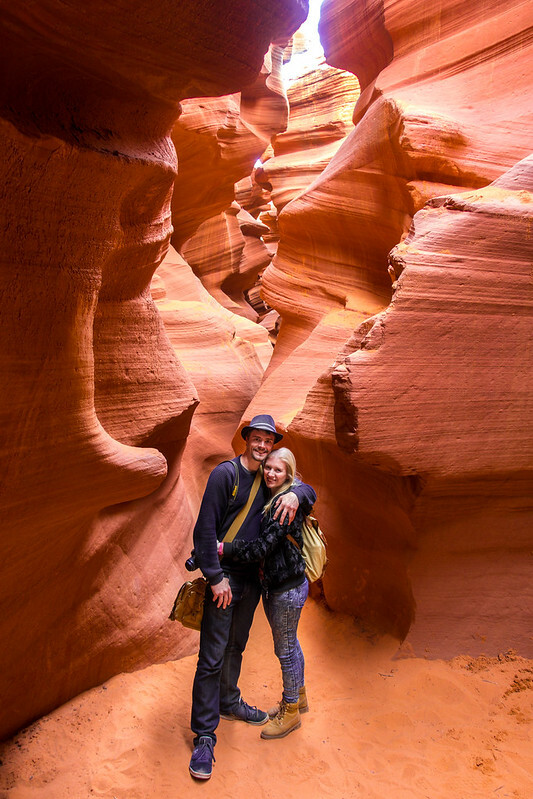 After parking up and paying at the shack, we were taken to the Lower Antelope Canyon by Rob: an extremely cool dude from the Navajo tribe. Our education began the minute we started walking across the desert to the canyon entrance, as Rob pointed out different plant species and explained how his tribe traditionally used them. 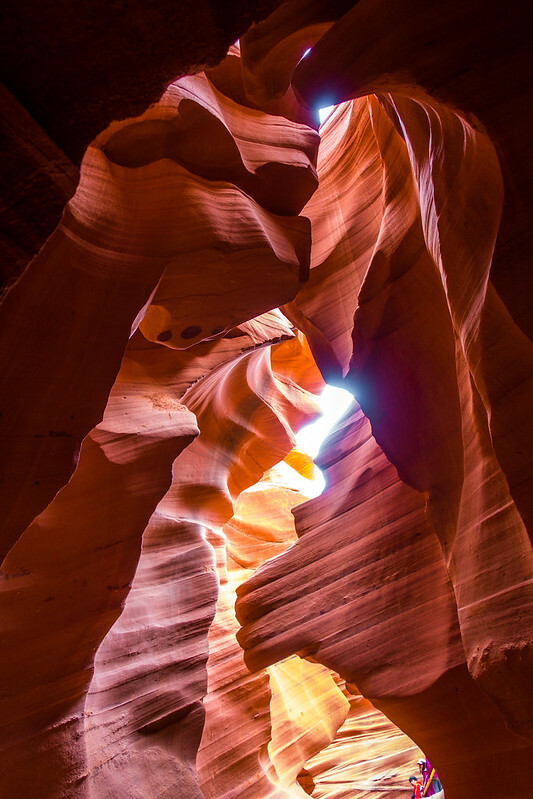 In a couple of hundred metres we came to a rocky plateau split by a dark, narrow crevice – you wouldn’t know it, but this hole in the ground is Lower Antelope Canyon. The only way in is down a steep set of narrow metal stairs, which our group had to descend one by one. Below the surface lay another world. 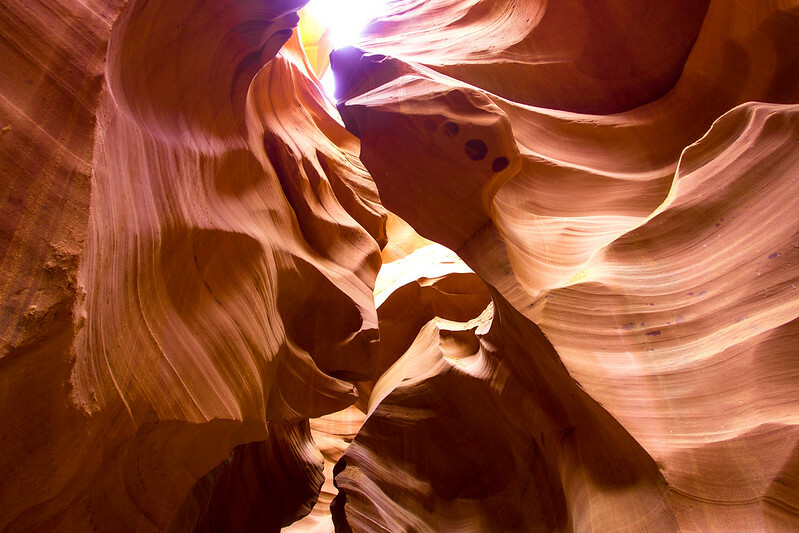 Shielded from the sun’s glare, the canyon’s dark recesses erupted into layers upon layers of warmly glowing rock, curling, twisting, wrinkling and jutting in endless weird and wonderful ways, creating bizarre new shapes at every turn. 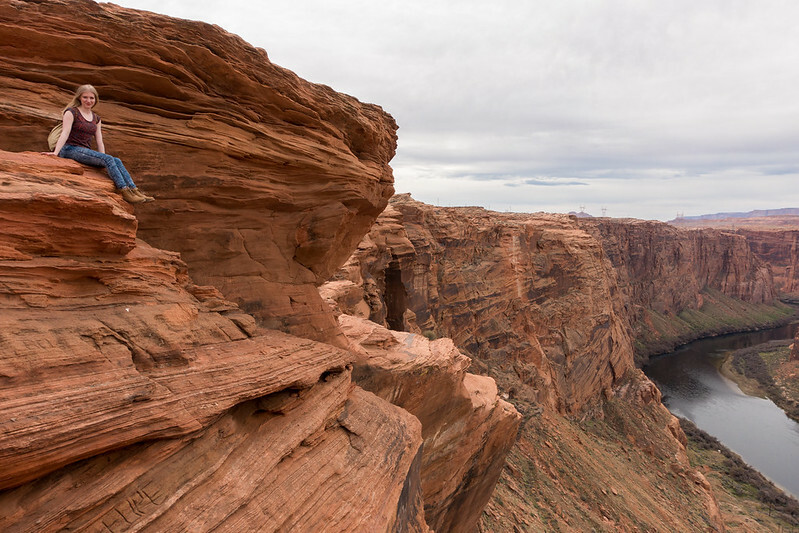 Upon reaching the canyon floor our group stood mesmerised in the cool, still and quiet air. Our guide Rob began by advising us how to set the settings on our phones and cameras in order to bring out the colours of the rock, which was probably more helpful for the phone photographers. 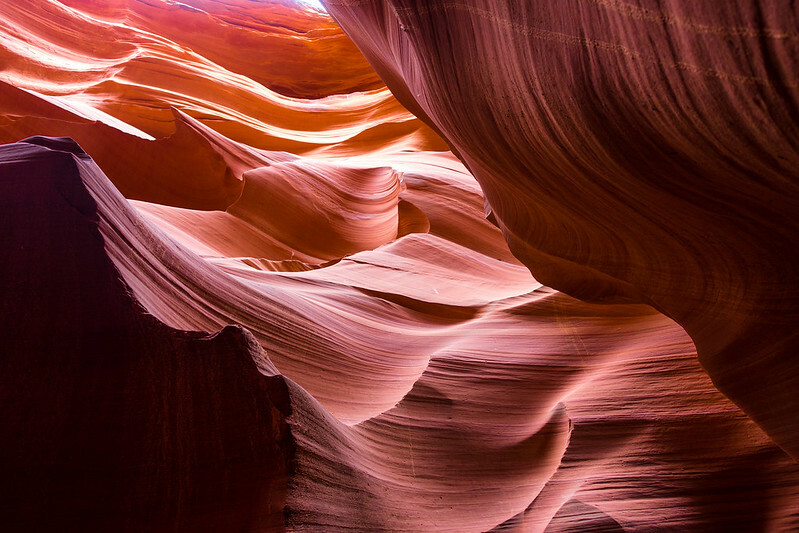 Leading us through the twists, turns, climbs and dips of the narrow, tunnel-like canyon, he explained its formation and history, and pointed out shapes in the rock that people had interpreted as creatures. He also told us more about the Navajo tribe, which I thought was especially fascinating. Best of all, at particularly photogenic sections he stopped to take photos of us in our individual groups, which was lovely of him. The cavern alternated between narrow sections we had to squeeze through sideways, to larger antechambers where we stopped to listen to Rob. For the most of the way we had a good amount of time in each area and were not especially rushed. However, it did get a bit congested when we ran into a photography tour, which was given priority. 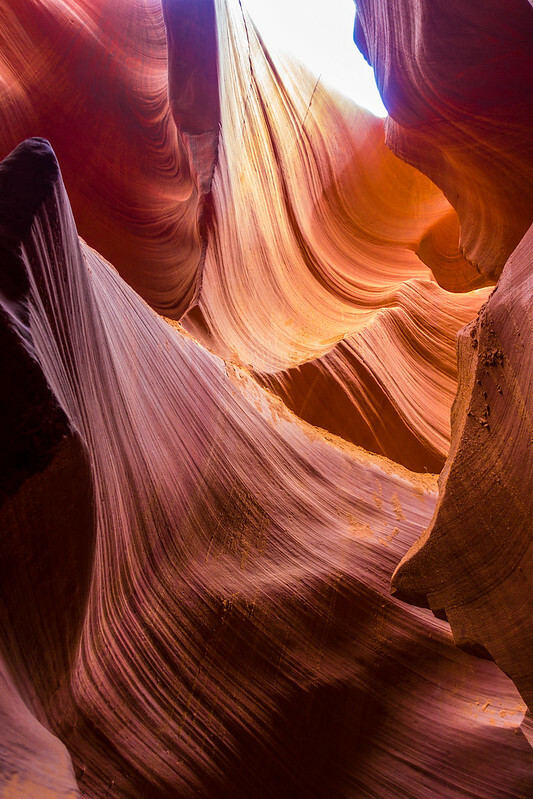 Even with these slight interruptions, being in that hallowed space between and beneath the canyon’s high, contorted walls felt really special. Eventually our journey came to an end and we climbed back up to the surface, blinking in the sunlight. Rob led us back to the Dixie Ellis shack and gave everyone a chilled bottle of water – another really nice touch. We’d seen Page’s main attractions now, but there was still more to see before we left. The tourist newspaper we’d picked up earlier mentioned somewhere we could drive to called Scenic View, and we decided to check it out. 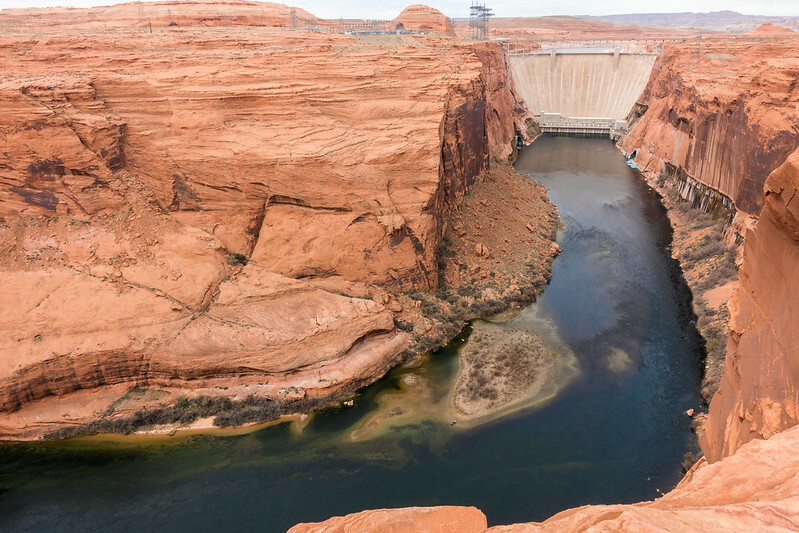 The view was of Glen Canyon Dam, just a little further up Colorado River from Horseshoe Bend. It was easy to reach, just a short walk down from the car park, and we couldn’t resist clambering over the rippled piles of sandstone to see the river valley from different angles. 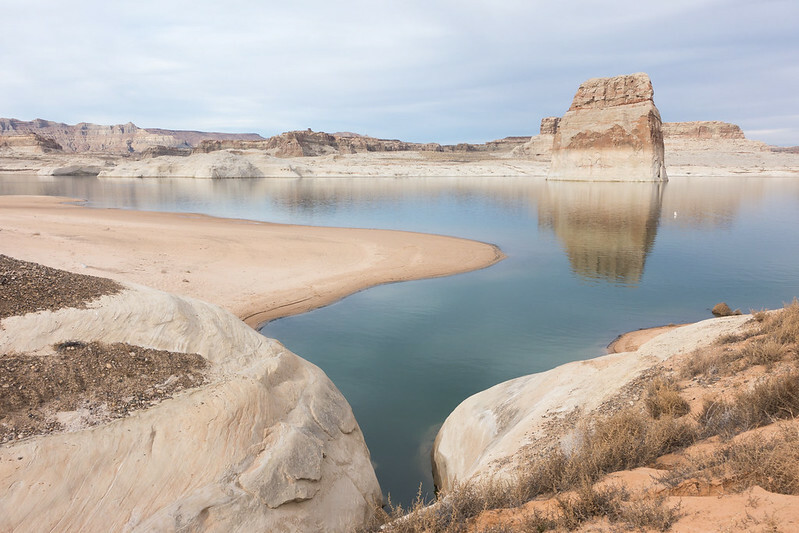 We were surprised again by how green Colorado River appeared – particularly against the red valley walls. The river was pretty scenic but even more spectacular, I thought, was the amazing wrinkled landscape on which we stood. 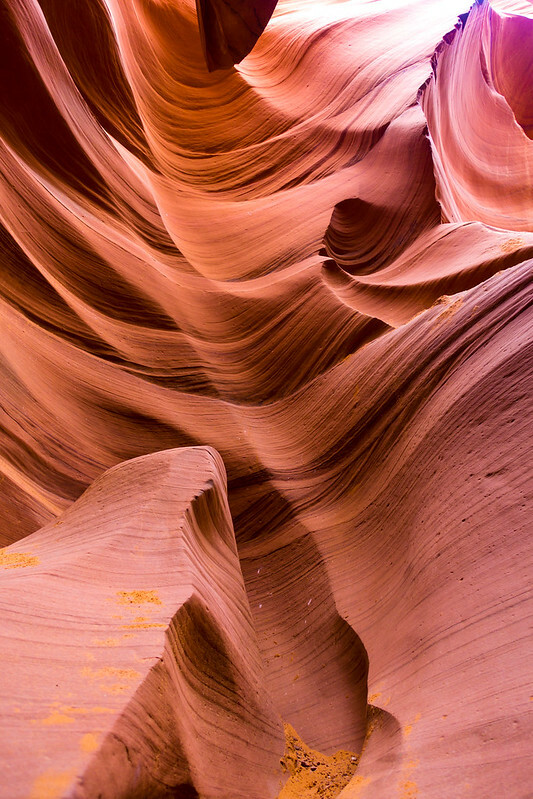 The predominantly red sandstone held an amazing array of colours within its crumbled layers, through green, yellow, orange, pink and purple. We stopped for lunch at the nearby Denny’s diner, and were served by a new-on-the-job waitress. She was rather clumsy and slow, but sweet enough to get away with it. 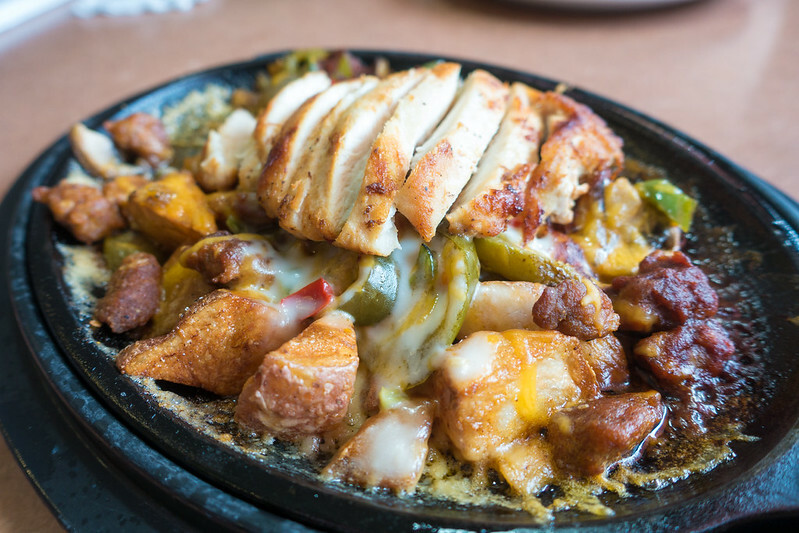 Steve had a sriracha burger and a chocolate milkshake, while I had a ‘crazy spicy skillet’ with grilled chicken breast, chorizo, cubed potatoes, flame grilled peppers, onions and mushrooms, topped with jalapenos, spicy sauce and loads of cheese. So tasty. We had just enough time left to make a detour for Powell Lake. 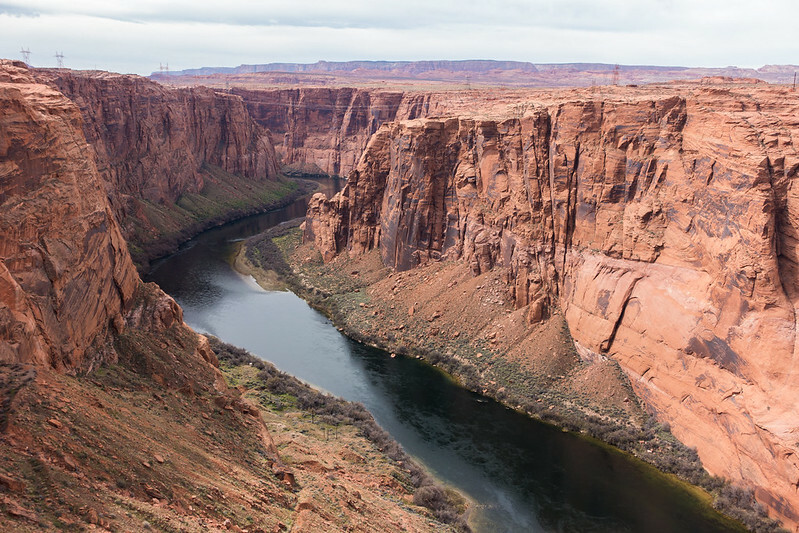 I’m glad we did, as it presented a landscape that could barely have been more different to those we’d seen around Colorado River. We reached it by driving down an empty road, past a shuttered visitor’s pass station and into a deserted car park, followed by a walk across an expanse of firm white sand to the shore. In contrast to the vivid turquoise and orange of Horseshoe Bend, the landscape we found at Powell Lake’s shore was awash with pastel tones. The water was pale blue, reflecting the sky and clouds, and the cliffs bleached with striped tones of off-white. It felt a world away from the landscapes preceding it, despite being just several miles away. After taking some photos we returned to the car to continue our journey – next stop, Bryce Canyon. All text and images (c) Juliet Langton, 2016. All rights reserved. 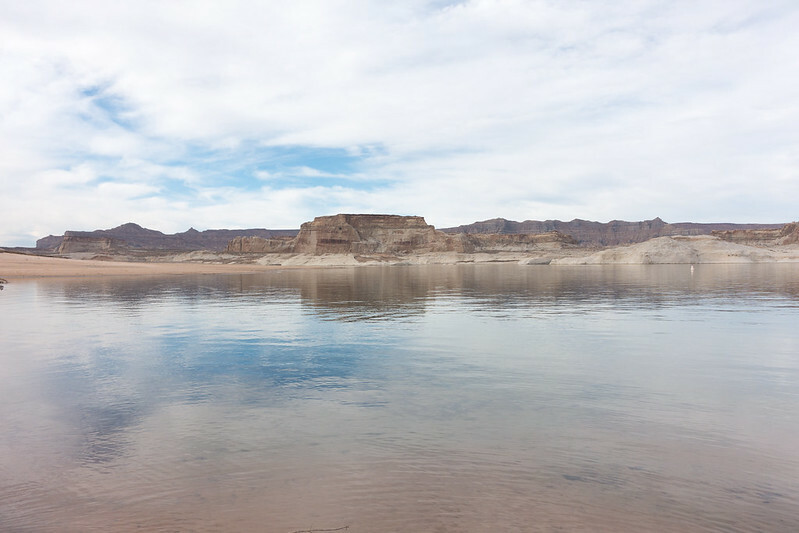 Posted in Photography, Travel, USATagged Arizona, Big John's BBQ, Dixie Ellis, Featured, Glen Canyon Dam, Horseshoe Bend, Lower Antelope Canyon, Page, Powell LakeBookmark the permalink. 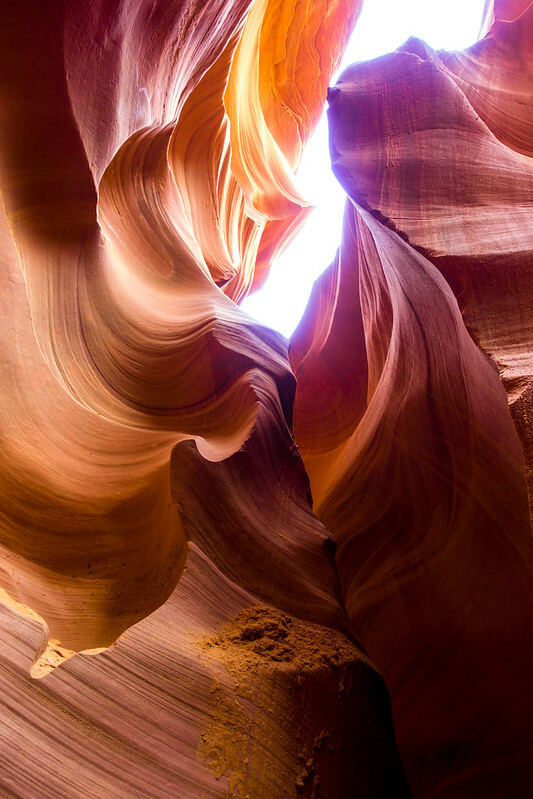 Antelope Canyon looks like a dream. I can imagine it’s even better than photos. Being there is something special, for sure! 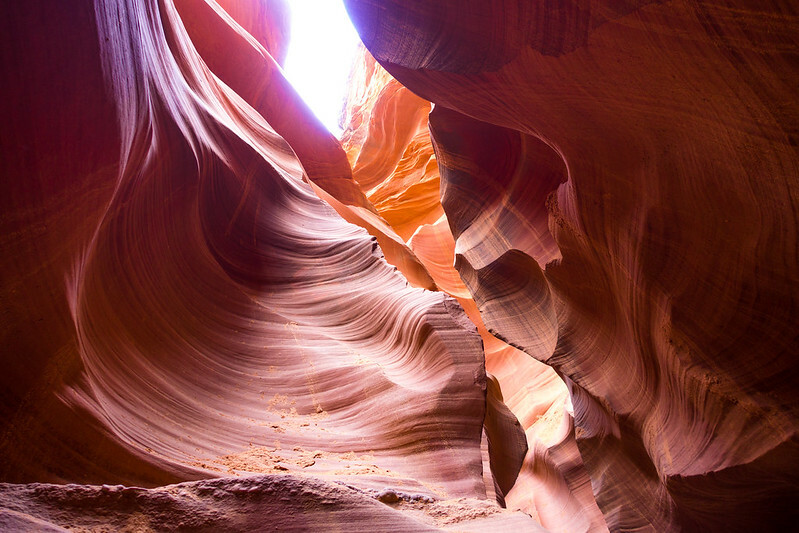 I’m sure you will see many more incredible sights, whether these are included or not! Hahaha! A large smoker of that kind certainly won’t have drawn us in! Thank you!